Yet, another Daily Paintworks Challenge! 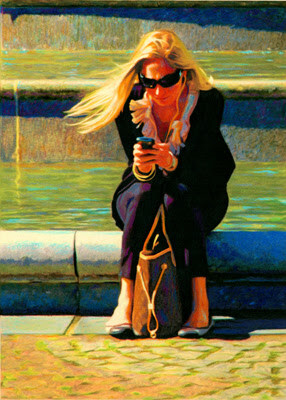 I love doing figures, and I have already done an oil painting on this theme, All A Twitter. Many of you have commented on the use of my color on the DPW site. I love color, it is music for my eyes! New York is pretty drab, but definitely an exciting place. Color is what excites me and is a good metaphor for the sounds, smells and intensity of the city as well as the look in this woman's posture and face. I haven't worked in acrylic lately, other than demonstrating for my students. Thought I'd give in a whirl! I used a limited palette and like the subtle difference in the color scheme.